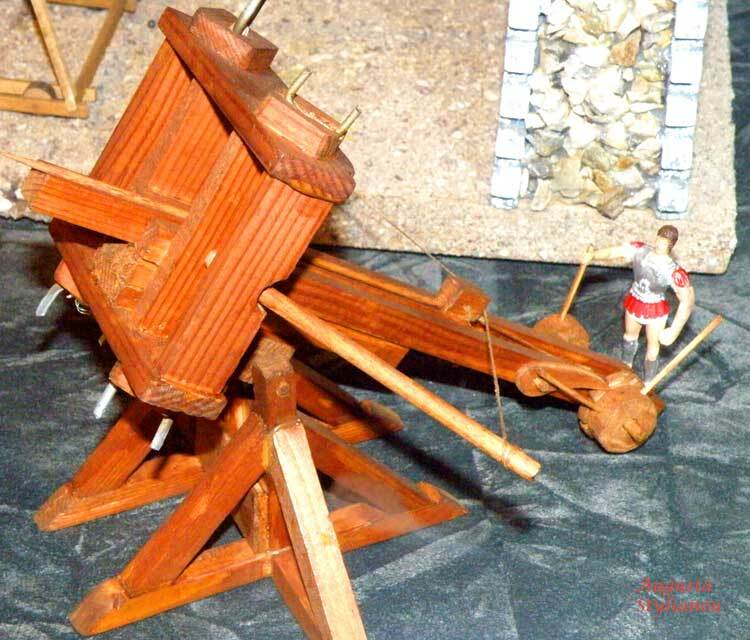 A representation of the siege machine of the catapult-stone or arrow blaster type. It was constructed by Diades from Pella, the engineer of Alexander the Great and it was used in the expeditions of the great victorious army commander. Its motive power was due to the force of the two springs that were made from twisted animal nerves or women's hair (neura). The manipulators rotated the shaft (which had an interlocked mechanism and a release bracket) by means of levers. So the traction that is the wooden stave with the groove, was dragged backwards and the stone or the arrow was then placed on it. Afterwards the trigger was pulled and the stone or arrow was pelted.